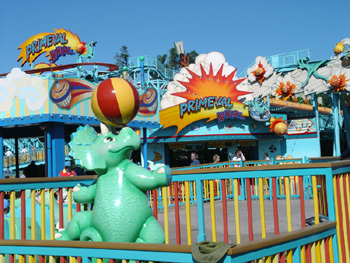 Primeval Whirl is located in Chester and Hester’s Dino-Rama. 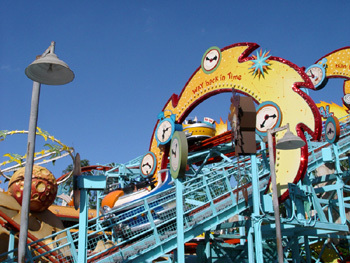 Themed after old-fashioned carnival roller coasters, you’ll enter your “time machine” and travel along one of two tracks. Your free-spinning car sends you swirling and twirling downhill along it’s twisting path. With lights flashing and bells ringing, it’s a fairly simple ride but still a lot of fun. Guest must transfer from wheelchair or ECV. There are currently 27 reviews for Primeval Whirl. 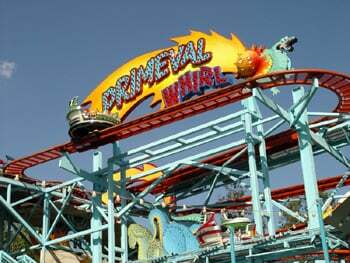 Read Full Primeval Whirl Reviews! You can also search for Primeval Whirl specific threads!